Much has already been made of Ridley Scott’s bold and ballsy decision to completely remove disgraced actor Kevin Spacey from his latest film All The Money In The World, and then reshoot his scenes with Christopher Plummer all within a month of its release date. However, as fascinating as it is that Scott, at 80 years old, was able to do all this and still have his movie come out around the time it was originally scheduled, the more important matter is of whether the film is any good or not for it to be worth all of this unexpected controversy. The answer, thankfully, is (mostly) yes, as while All The Money In The World isn’t exactly the easiest watch, and it might not quite be the astounding movie I wanted it to be, it is still a solid thriller filled with exceptional performances and a filmmaker who has not expressed this much passion in the director’s chair for a long while. The film retells the kidnapping of young John Paul Getty III (Charlie Plummer; no relation to his new on-screen grandpa) in Rome during 1973, with his kidnappers demanding a $17 million ransom from his mother, Gail Harris (Michelle Wiliams). Gail is the former wife of the son of oil tycoon J. Paul Getty (Spacey Plummer), then the richest man in the world, and as per a divorce agreement she doesn’t have the money with which to pay the ransom for her son, but to make matters worse Getty Sr. publically refuses to pay a cent for the safe return of his grandson, leaving Gail and Getty’s key negotiator Fletcher Chase (Mark Wahlberg) to find other ways to obtain the money before young Getty is harmed or worse by his captors. Whether or not you’re familiar with the real-life story behind the kidnapping of John Paul Getty III, the ride that Scott takes you on as it goes from point A to point B is extremely engrossing, if not entirely digestible to stomach sometimes. There are scenes in this movie that will leave you on edge thanks to just about anything, from threatening calls by the kidnappers to the incessant and overbearing presence of the paparazzi at every corner, and it’s so tightly directed by a filmmaker who’s clearly as fascinated in this story as much as the audience is, that it feels entirely natural and all too frighteningly so. It feels as though Scott has made his very own David Fincher movie, and I absolutely mean that as a compliment; sometimes it can get so disturbingly on point and often unpleasant in its details, that it makes the entire aesthetic of the film seem appropriately gritty and darkly subversive. Though the similarity between both directors is almost uncanny here, you can definitely still tell this is a Ridley Scott film, and it’s one that ranks among the filmmaker’s strongest in many years. David Scarpa’s script also tells this story from many different angles, all of them fascinating in their own unique way, and which are boosted by some truly great performances. We get to see what it is like from the kidnapper’s point of view, particularly one that’s played by French actor Romain Duris who befriends young Getty as he’s being held captive and forms a genuine bond with him, even protecting him from a much more grisly fate at the hands of his far more aggressive captors. Those scenes are great because they’re not only directed and written so convincingly, but Duris is an intimidating but ultimately semi-heroic presence in the role, while young Plummer plays someone who you seriously root for as he’s placed in one horrifying situation after another. Then, of course, there are plenty of scenes where Williams and Wahlberg act circles around one another, and both of them are so good here – Williams especially, as a woman who’s going through the worst possible scenario for a mother to go through and wants to do whatever she can to get her son back – that they are utterly convincing in their very different but equally emotionally-driven parts. And yes, let’s talk about Christopher Plummer; he is, as you would expect from an acting legend like him, absolutely fantastic in this movie, playing the part with such a self-satisfied and smug exterior that it expertly masks his absolute coldness when it comes to his own family, choosing to invest his money in pieces of artwork and villas instead of putting some aside to help out his kidnapped grandson. While one wonders what Spacey would have been like in the part – and who knows, we could end up seeing a cut of the movie with Spacey’s scenes intact in the future – it will be hard to top anything that Plummer does with the part, and keep in mind he did all of this in just under two weeks literally at the last minute at Scott’s bequest. The acting’s great, the direction is solid, and the writing offers interesting points of view to this very real event, but I will be the first to admit that, despite all the positive things I can say about it, I struggled to really, truly love this movie. It can be a bitter watch, one that doesn’t always show it has much of a heart or even a strong emotional connection, even when you completely understand everything the characters are going through, and it tends to drag with plot points that end up not mattering in the overall scheme of things – a brief detour sees characters come to a conclusion that the kidnapping may have been a ruse by young Getty to get money from his grandfather, which obviously wasn’t the case but by the time the characters realise that, too much time has been spent on this rather pointless footnote that several minutes of the movie have just been wasted. It’s certainly captivating to watch, but in terms of creating a truly emotional experience, it just wasn’t strong enough in that department. But don’t let that discourage you from seeing this movie, as while it may not be the grand epic that some may have been hoping for, especially for all its presence in the news lately about Scott’s ballsy last-minute decisions, it is still one of the director’s strongest movies in a long while, as he clearly gives it everything he’s got in terms of mood, atmosphere, performances, pacing (to a point, anyway) and many others to tell this incredible true story with some of the finest actors working today and a script that, despite its occasional meanderings, brings out the sheer cinematic quality in such a horrific example of money over manners. 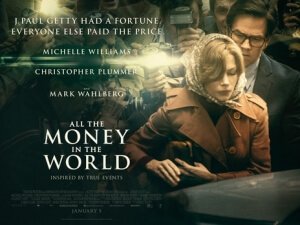 All The Money In The World ranks among Ridley Scott’s most accomplished movies in recent years, filled with excellent direction and fantastic performances, especially from Michelle Williams and last-minute replacement Christopher Plummer, which are more than enough to make up for its occasional lack of empathy and its often meandering script.